Garmin nuvi 30 is part of Garmin’s collection of essential sat navs providing GPS navigation at its simplest. It is ideal for those who want something easy-to-use and reliable. Garmin nuvi 30 has a compact, 3.5-inch touchscreen display and is preloaded with maps for Western Europe. Garmin nuvi 30 has Lane Assist to guide you into the correct lane for approaching turns and exits, and Junction View to display an image of the upcoming junction so you know what to expect. Garmin nuvi 30 has been discontinued. Accessories, spares and parts are still available for your nuvi 30, as are the road maps. Garmin nuvi 30 gives you accurate turn-by-turn directions and spoken street names so you know exactly where you’re going. It has our unique Cyclops speed cameras, Lane Assist with Junction View and hundreds of thousands of points of interest such as hotels, restaurants and attractions. Above all it has user-friendly menus to make driving as stress-free as possible. *NOH - A newly overhauled (NOH) device is a device that was returned to Garmin to be factory refurbished. To read more click here or scroll to the base of this page. The more expensive eTrex 30 listed below the NOH model above is brand new stock, hence the saving with the eTrex 30 NOH model. They both include and do exactly the same and have a 1 year warranty. Garmin nuMaps Guarantee - simply register your new Garmin nuvi 30 within 90 days of first using your sat-nav to see if a free map update is available. See map coverage below for more details. Avoid confusion at tricky exits and junctions. Garmin nuvi 30 has Lane Assist to guide you into the correct lane for approaching turns and exits, and Junction View to display an image of the upcoming junction so you know what to expect. There are hundreds of thousands of points of interest stored inside your nüvi. Whether you want to find a Chinese restaurant, a theatre or an airport, nüvi 30 will find what you want and you can get directed straight there. The Garmin nuvi 30, like all Garmin sat nav's, gets its speed camera data from the Cyclops speed camera database. The database provides advanced alerts to fixed, average speed, mobile, variable, temporary roadwork, red light and red light speed cameras. As you approach a camera, your device sounds an alert. Subscription charges apply. Click here to read more about the Cyclops speed trap database. The Garmin nuvi 30 has been designed to be plug and play, and as such can be transferred from vehicle to vehicle with ease. The Garmin nuvi 30 is powered via the supplied vehicle power cable. The Garmin nuvi 30 then attaches to your vehicles windscreen via the Garmin nuvi 30 suction cup mount. Alternatively using the supplied dashboard disk you can mount the suction cup mount on top of your dashboard instead. Garmin nuvi 30 comes preloaded with detailed City Navigator street maps for the UK and Western Europe (22 countries) provided from map supplier NAVTEQ. Rolling screen transition, accelerated map redraw and routing capabilities make screen zooming even smoother and ensure the navigation always matches your pace. Further Garmin nuvi 30 maps are available SD card which insert directly into the Garmin nuvi 30. 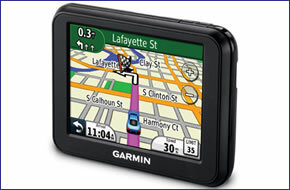 Available Garmin nuvi 30 maps include North America, Australia and New Zealand, Middle East and Southeast Asia. Garmin nuvi 30 maps. Get the newest maps available and navigate with confidence with Garmin nuMaps Guarantee. Simply register your new Garmin nuvi 30 at my.garmin.com within 90 days of first using your sat-nav to see if a free map update is available. With Garmin nuMaps Guarantee, you'll be up-to-date when you hit the road. Looking for accessories and spares for the Garmin nuvi 30? All parts are genuine Garmin product and specifically designed for use with the nuvi 30. Accessories available to purchase include vehicle power charger, suction cup mount, a weighted dashboard mount and an air vent mount kit. Along with these accessories, it's also possible to buy replacement parts such as suction cup mount and vehicle charger. View all of the nuvi 30 accessories here. Looking for sat nav maps for the Garmin nuvi 30? All mapping comes on microSD card with SD card adaptor and is genuine Garmin product and specifically designed for use with the nuvi 30 Countries available to buy include: UK and Ireland, France and Benelux, Full Europe, North America, Australia and New Zealand. View all of the nuvi 30 compatible maps here.